It looks like a lot because it is a lot. 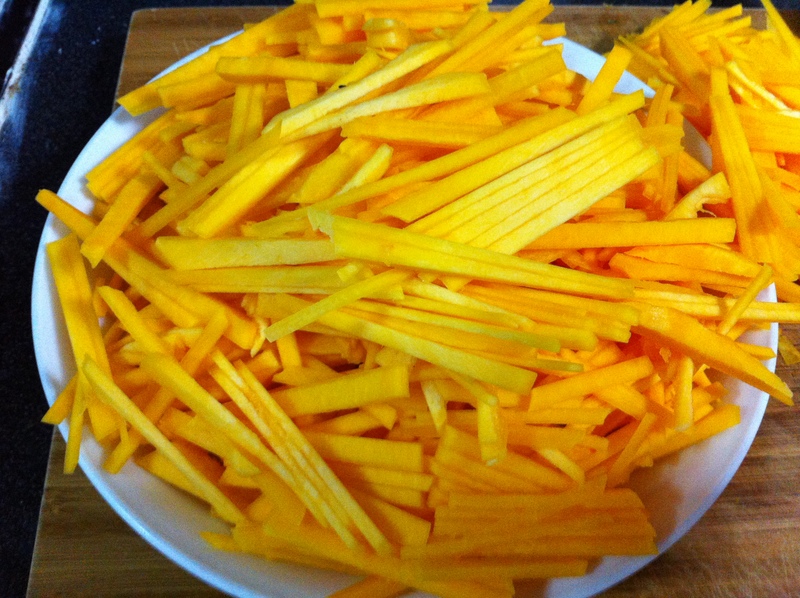 Pumpkin is one of my kids’ favourite – but not mine because of the cutting – and I was planning to make a double portion for the next day’s use. So it was a lot of cutting involved. A very painful thing to do, which I do not want to repeat again. Even half that amount would be too much work for me. Masa, as a pro, probably does not find cutting pumpkin a problem. But I do hate cutting pumpkin and I hate to cut pumpkin into matchsticks the most after this experiment. After what seemed like endless cutting, finally, the stir-fry part. I did it batch by batch because there was a sauce involved and to make sure the pumpkin was seasoned evenly, I did not think stir-frying a huge batch was a wise move. Altogether, I did it in 3 batches. The first batch was a little over-cooked. According to the recipe, the pumpkin is supposed to retain its crunchiness. Because of the matchstick size, the pumpkin actually cooked and softened very quickly. Hence, for subsequent batches, I had to speed up the cooking and remove the pumpkin matchsticks from the heat before they turned soft. Kids’ Verdict? They loved it. My verdict : The taste is not bad actually, but it is not my favourite dish. Maybe because I am not particularly fond of pumpkin. But to eat pumpkin that still retains the crunchiness is interesting. I actually don’t hate it and may even prefer it to pumpkin that has been cooked soft. As for how much time I took to cook this, I really don’t know. Too long is all I know, because of all the cutting. The time stated in the recipe is only 5 minutes!!! 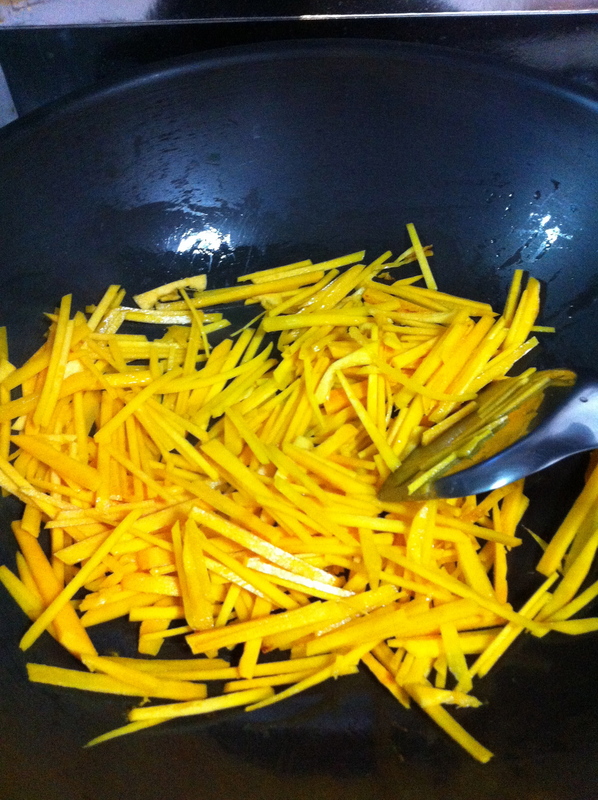 However, that is because the amount is meant for 1 serving as a side dish, which means very little. If I am cooking that small amount just as a bento filler, maybe the cutting would not be so hateful. 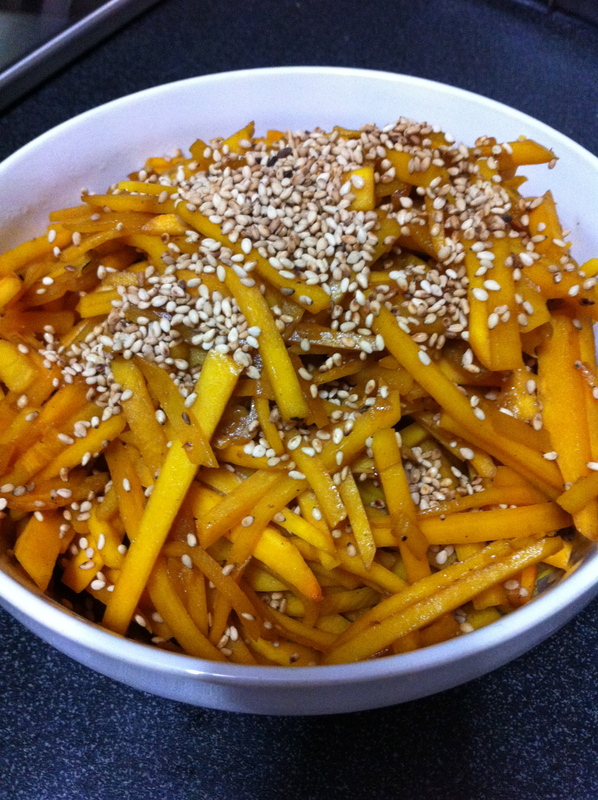 However, as a dish to be eaten by the family, this Kinpira Style Stir-fried Pumpkin will not do for me. I hope the kids will not ask for it again.